When you open a workbook Excel not only raises the Workbook_Open event but also a few other events. The same applies to switching worksheets, or closing the workbook. In this post I examine the sequence of activation/deactivation events in an Excel multiple window application, and with a ribbon custom tab. However, most of the findings also apply to normal single window applications without a custom tab, and also to Excel 2013. Range       - within the active sheet the user can switch to another cell. Note that this is not a true hierarchical relationship, since the parent of a sheet is the workbook, not the window. The conceptual model in the figure above presents an overview of the five levels and their Activate/Deactivate events. You may keep this in mind when reading on. Note that on every level two events are raised when switching to another object. However, on Range level only an “Activate” event is fired (SelectionChange). 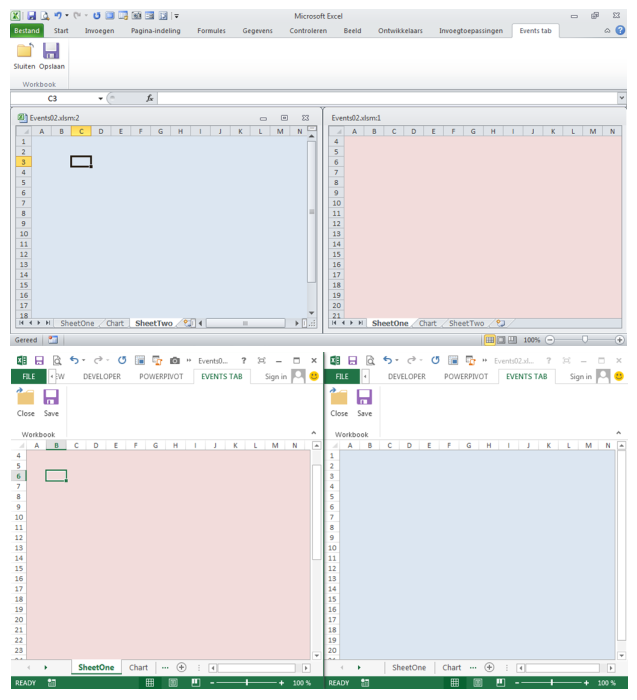 ExcelEvents1.xlsm is a workbook with two worksheets and two windows, and a custom tab with two cloned controls. In the workbook and worksheet modules all relevant events are defined. Most events have only two lines of code, to create a trace list in the VBE Immediate Window. Consider this trace list as an extension of the VBE Call Stack. At startup Excel not only fires a Workbook_Open but also a Workbook_Activate and a Workbook_WindowActivate event. Always in this sequence. Note that the Workbook_WindowActivate is always fired, even when your application has only one window. Since most Excel applications have a single window interface we usually don’t need this event. The trace list above makes clear that the custom tab is loaded after the three workbook events. This gives you the opportunity to initialize any data structures that are used by the controls in the custom tab before these controls are loaded. For example, perhaps some controls must be hidden or disabled on startup. Or in Workbook_Open you determine the language to be used in the custom control labels. If you add a msgbox statement in the Workbook_Open handler, code execution will pause until the user closes the messagebox. Obvious. But now replace the msgbox by a Stop statement. Then something else happens: after re-opening the file you receive one or more messages saying that VBA can’t execute code in debug mode. After closing these messagebox(es) and continue running your code (F5) the Ribbon.customUIonLoad is missing in the trace list and indeed was not executed. However, the custom tab is installed. Keep the Stop in the Workbook_Open handler and again re-open the app. Now use F8 to step through your code, and watch the trace list when you press F8 on “End Sub”. Conclusion: if you want to debug and step through your startup code then you have to set breakpoints in each fired events. Be aware of this potential debugging pitfall. Disabled events or deferred events? Again we see that the ribbon does things its own way, ignoring the events setting. (See Disable Shift key on open.) Indeed, the ribbon is not part of the Excel Object Model, just like activex controls and userforms. The two Activate events were not fired, as we could expect. However… are they really not fired? Do some switching between sheets and windows, and you will see that no new events occur. Obvious, we disabled them. But then go to the VBE Immediate Window and set eventenabling to true. Immediately the two “missing” events are fired! Or perhaps we should say: processed. They were fired at startup before events were disabled. Disabling events does not kill any events that were fired already. Processing was deferred until events were enabled again. At startup Excel always activates the last window. If your app has 5 windows then the window with WindowNumber = 5 will be activated, even when you saved it with window 3 active. This is important to note. If you want your user to start on the first window you might be tempted to activate window 1 at the end of Workbook_Open. It will do so, but remember: after the Workbook_Open a Window_Activate is fired that will activate window 5! Indeed, this can be very confusing. A simple workaround is to create your windows in reverse order. Or activate your preferred window later, in the Workbook_WindowActivate handler. And in Worksheet_Activate of Sheet1 you call Me.Initialize. Note that only Sheet1.Activate is not sufficient: if Sheet1 is already the activesheet this event won’t fire. Again, note that there’s no SheetDeactivate or SheetActivate event fired. If you want for example a userform visible when SheetOne is active then you must trigger the show/hide of the userform from another event. The obvious event is the WindowDe/Activate, where you can Init/Exit the active sheet. Still no SheetDe/activate events fired, even if the two windows show different sheets. See the previous paragraph for a solution if you need to do some inits/exits for a sheet. Finally, a SheetDe/activate! Note that first the lowest event level is fired. More on this later. Keep in mind that the Before_Close event is not the last event being handled. No surprises. Let’s move on. Handling the events starts on the lowest level, then moving up in the hierarchy. This solution is implemented in ExcelEvents3.xlsm, see next item. There is no MyWorkbook_Open event in the list. Since event trapping is set in the Workbook_Open handler it is not possible to trap this event before it is processed. Seems obvious, so actually there was no need to expose this event to the class. You can use Events3.xlsm to do some more research on trapped events. If you want you can add other events to the classes, or add classes to trap embedded chart events, or querytable events. Whatever. A chart can be either an embedded chart (contained in a ChartObject object) or a separate chart sheet (quote Microsoft MSDN). If the chart is embedded it behaves just like any other object that can live on a worksheet. For example, on a worksheet you can switch the selection between cells, charts, controls, images etc. You can create a class to trap embedded chart events, much like you create a class to trap querytable events. No big deal. And what about Excel 2013? Microsoft decided to move Excel 2013 from MDI to SDI. Does this change the event model as we described above? Quote from MSDN: “SDI means that each workbook will have its own top-level app window and will have its own corresponding ribbon. 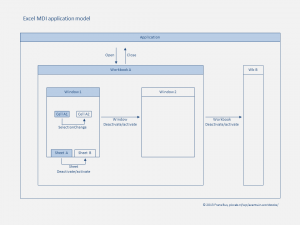 All existing application-level window methods, events, and properties are unaffected by this change. All existing workbook-level window methods, events, and properties now operate on the top-level window for that workbook.” So the answer is: no, not at all. The only – big – difference is the way the windows are presented to the user, see screenshots. In 2013 every window has it’s own ribbon and statusbar, which makes a multi window arrangement in 2013 much less attractive. Nevertheless, even in 2013 Excel will raise all events and event series as described above. 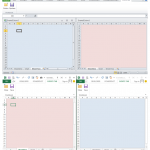 In this post I examined the sequence of events in a MDI Excel app with two windows. Most apps are SDI and are perhaps a bit less complicated. In any case, MDI or SDI, it is important to be aware of the events and event series that are fired by Excel and when and how they are processed. As we have seen this is not always obvious. 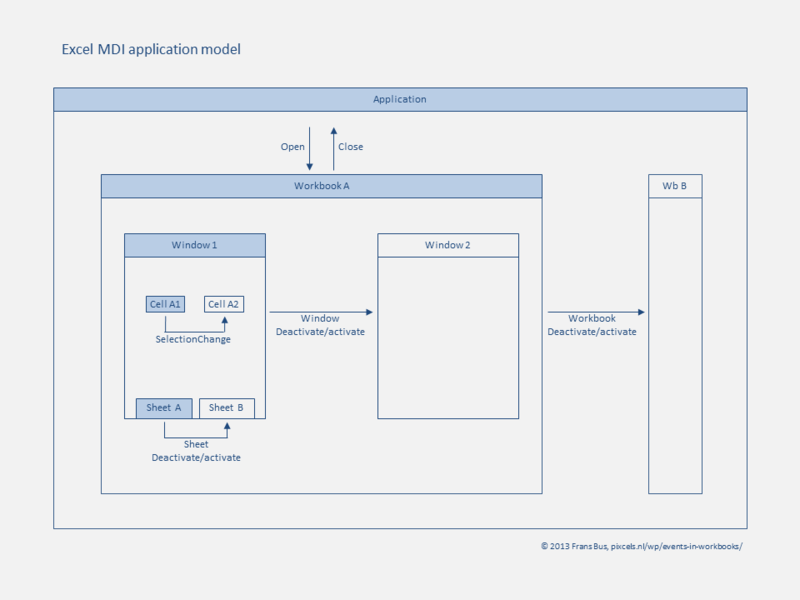 An event driven multi window application requires good planning and good design. In upcoming posts I want to share some more on these issues. For now: I hope this pixcel helps. Excel! your post is very precoious, your work very sharp. MS should pay for your clear explaination! Is Ribbon.customUIonLoad the last event when opening a workbook? I’m trying to prevent to possibility of changing the ribbon XML so that the visibility of Admin buttons can be changed. Thank you SO much for this very helpful article! I was pulling my hair out trying to understand why certain events were being triggered (or not). This has solved all of those issues and I am very thankful. When multiple files exist in the “At StartUp” location…..how does Excel determine which file first, second, etc? Excel fires 1 or more invisible processes before worksheet_activate. 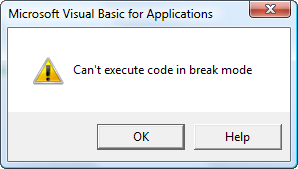 The Excel VBA programmer can not prevent broken link messages. You can fix all linked worksheets in workbook_activate. Excel does not care. The subroutine call order is: Microsoft_whatever, then Microsoft_ignoreOurOwnAPI, then workbook_activate. Any idea what could be the issue if I don’t see a Workbook_Open event at all in the log (Excel 365 Pro Plus)? For large complicated workbooks I have experienced timing issues which resulted in Sub Auto_Open appearing to be the first procedure to run. As my workaround, the first thing Auto_Open does is to check if the Workbook_Open event has been triggered. If not, then Workbook_Open & Workbook_Activate are called to get things back on track. Then Auto_Open can proceed to do real work. Thanks for the thorough explanation. Much appreciated. Microsoft used to include the order of events in the offline help file but I don’t see that on the web help. I noticed when I switch focus to any VBE window none of the above events fire. Are you aware of any event to catch switching focus from an Excel application window to the VBE and back?